A commercial Cygnus cargo freighter departed the International Space Station (ISS) this morning (Feb. 19) after successfully resuming America’s train of resupply runs absolutely essential to the continued productive functioning of the orbiting science outpost. NASA astronauts Scott Kelly and Tim Kopra commanded the release of the privately developed Orbital ATK “S.S. Deke Slayton II” Cygnus resupply ship from the snares of the stations Canadian-built robotic arm at 7:26 a.m. EST – while the space station was flying approximately 250 miles (400 km) above Bolivia. “Honor to give #Cygnus a hand (or arm) in finalizing its mission this morning. Well done #SSDekeSlayton!” Kelly quickly posted to his social media accounts. The Orbital ATK “S.S. Deke Slayton II” Cygnus craft had arrived at the station with several tons of supplies on Dec. 9, 2015 after blazing to orbit on Dec. 6 atop a United Launch Alliance (ULA) Atlas V rocket from Cape Canaveral Air Force Station in Florida on the company’s fourth NASA-contracted commercial station resupply mission dubbed CRS-4. To prepare for today’s release, ground controllers at NASA’s Johnson Space Center first used the station’s 57.7-foot-long (17.6- meter-long) robotic arm, Canadarm2, to unberth Cygnus from its place on the stations Earth-facing port of the Unity module at about 5:38 a.m.
Cygnus came loaded with over three tons of critically needed supplies and research experiments as well as Christmas presents for the astronauts and cosmonauts living and working on the massive orbital lab complex during Expeditions 45 and 46. Altogether, Cygnus spent approximately 72 days attached to the station. During that time the crews unloaded all the research gear for experiments in areas such as biology, biotechnology, and physical and Earth science. “All good things must come to an end. #Cygnus, your mission was a success! Farewell #SSDekeSlayton,” said Kelly. Mission controllers at Orbital ATK’s Dulles, VA space operations facility soon commanded Cygnus to fire its thrusters to gradually maneuver away from the station. Before departure, the crew had loaded Cygnus back up with about 3000 pounds of trash for disposal. On Saturday, after the spacecraft is far away from the station, controllers will fire the engines twice to pushing the vehicle into Earth’s atmosphere for a fiery reentry where it will harmlessly burn up over the Pacific Ocean. Meanwhile, Kelly himself will also be departing the ISS in about ten days when his historic ‘1 Year ISS Mission’ concludes on March 1, when he returns to Earth on a Russian Soyuz capsule along with his cosmonaut crewmates Mikhail Kornienko and Sergey Volkov. December’s arrival of the Orbital ATK Cygnus CRS-4 cargo freighter – also known as OA-4 – represented the successful restart of American’s critically needed cargo missions to the ISS following a pair of launch failures by both of NASA’s cargo providers – Orbital ATK and SpaceX – over the past year and a half. It was the first successful US cargo delivery mission in some 8 months. Cygnus was named the ‘SS Deke Slayton II’ in memory of Deke Slayton, one of the America’s original seven Mercury astronauts. He was a member of the Apollo Soyuz Test Flight. Slayton was also a champion of America’s commercial space program. CRS-4 counts as the first flight of Cygnus on an Atlas and the first launch to the ISS using an Atlas booster. This is also the first flight of the enhanced, longer Cygnus, measuring 5.1 meters (20.5 feet) tall and 3.05 meters (10 feet) in diameter, sporting a payload volume of 27 cubic meters. “The enhanced Cygnus PCM is 1.2 meters longer, so it’s about 1/3 longer,” Frank DeMauro, Orbital ATK Vice President for Human Spaceflight Systems Programs, said in an exclusive interview with Universe Today. This Cygnus also carried its heaviest payload to date since its significantly more voluminous than the original shorter version. “It can carry about 50% more payload,” DeMauro told me. “This Cygnus will carry more payload than all three prior vehicles combined,” former NASA astronaut Dan Tani elaborated. The total payload packed on board amounted to 3513 kilograms (7745 pounds), including science investigations, crew supplies, vehicle hardware, spacewalk equipment and computer resources. Among the contents are science equipment totaling 846 kg (1867 lbs. ), crew supplies of 1181 kg (2607 lbs. ), and spacewalk equipment of 227 kg (500 lbs.). Orbital ATK has contracted a second Cygnus to fly on an Atlas on the OA-6 mission, currently slated for liftoff around March 22, 2016. Liftoff was delayed about two weeks to decontaminate an infestation of mold found in cargo already packed on the Cygnus. NASA has also contracted with Orbital ATK to fly three additional missions through 2018. Orbital also recently was awarded six additional cargo missions by NASA as part of the CRS-2 procurement. 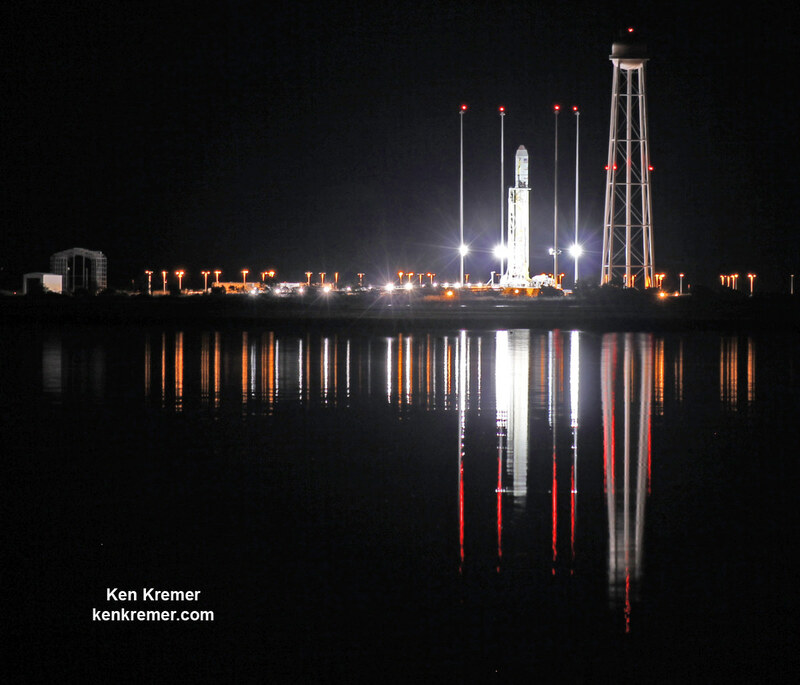 Orbital ATK hopes to resume Cygnus cargo launches with their own re-engined Antares rocket from NASA’s Wallops Flight Facility in Virginia this summer. The first British astronaut to blast off on a journey to the International Space Station (ISS) soared gloriously skyward early today, Dec 15, following the flawless launch of a Russian Soyuz capsule with his Russian/American crewmates from the Baikonur Cosmodrome in Kazakhstan. The picture perfect liftoff of the Soyuz TMA-19M rocket into clear blue skies with Expedition 46 Soyuz Commander and six time space flyer Yuri Malenchenko of the Russian Federal Space Agency (Roscosmos), Flight Engineer Tim Kopra of NASA, and Flight Engineer Tim Peake of ESA (European Space Agency), occurred at 6:03 a.m. EST (5:03 p.m. Baikonur time, 1103 GMT) on Tuesday, Dec. 15, 2015. The commercial Cygnus cargo spaceship, loaded with over three tons of critically needed supplies and research experiments, successfully rendezvoused and docked with the International Space Station (ISS) this morning (Dec. 9) after blazing to orbit on Sunday, Dec. 6, and thereby successfully resumed the American resupply chain to orbit – just in time for Christmas in Space! The Orbital ATK Cygnus CRS-4 resupply vessel arrived in the vicinity of the massive orbiting outpost around 530 a.m. EST today with pinpoint accuracy after precisely firing its maneuvering thrusters to home in on the complex during a two day orbital chase. KENNEDY SPACE CENTER, FL – The unplanned ‘Happy Marriage’ of United Launch Alliance (ULA) and Orbital ATK is set to give birth Sunday, Dec. 6, to a Cygnus cargo freighter bound for the International Space Station (ISS). Following two scrubs and a three day due to intense and wide spread rain squalls and excessive blustery winds, the third time is hopefully the charm for the Orbital ATK Cygnus resupply ship set for blastoff atop the venerable ULA Atlas V booster. KENNEDY SPACE CENTER, FL – The largest and most advanced version of the privately developed Cygnus cargo freighter ever built by Orbital ATK is fueled, loaded and ready to go to orbit – signifying a critical turning point towards resuming American commercial cargo launches to the space station for NASA that are critical to keep it functioning. The enhanced and fully assembled commercial Cygnus was unveiled to the media, including Universe Today, during an exclusive tour inside the clean room facility on Friday, Nov. 13, where it is undergoing final prelaunch processing at the Kennedy Space Center (KSC). 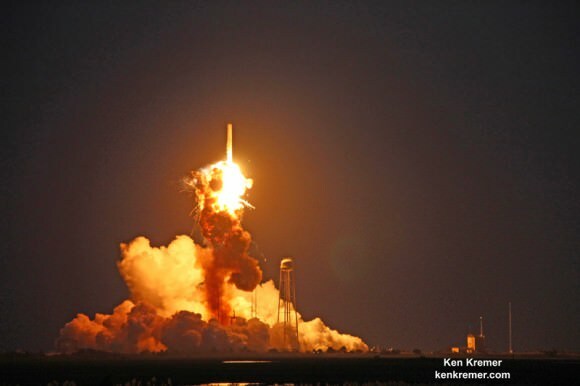 Orbital ATK is on the rebound with return to flight of their Antares rocket slated in early 2016 following the catastrophic launch failure that doomed the last Antares in October 2014 on a resupply mission for NASA to the International Space Station (ISS). Engineers are making “excellent progress” assembling a modified version of Antares that is currently on track to blast off as soon as March 2016 with the company’s Cygnus resupply ship and resume critical deliveries of research experiments and life sustaining provisions to the multinational crews serving aboard the orbiting outpost. “We are on track for the next Antares launch in early 2016,” said David Thompson, President and Chief Executive Officer of Orbital ATK in a progress update. Resuming Antares launches is a key part of the company’s multipronged effort to fulfil their delivery commitments to NASA under the Commercial Resupply Services (CRS) contract. “The focus all along has been to do everything we can to fulfill our commitments to delivering cargo to the space station for NASA,” Thompson stated. The key milestone was to successfully re-engine Antares with a new type of first stage engine that completely eliminates use of the original AJ26 engines that were refurbished 40 year leftovers – the NK-33 from Russia’s abandoned manned moon landing program. After the launch failure, Orbital managers decided to ditch the trouble plagued AJ-26 and “re-engineered” the vehicle with the new RD-181 Russian-built engines that were derived from the RD-191. 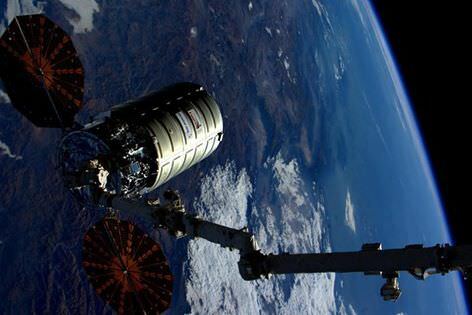 Orbital ATK holds a Commercial Resupply Services (CRS) contract from NASA worth $1.9 Billion to deliver 20,000 kilograms of research experiments, crew provisions, spare parts and hardware spread out over eight Cygnus cargo delivery flights to the ISS. NASA has recently supplemented the CRS contract with three additional Cygnus resupply deliveries in 2017 and 2018. Until Antares flights can safely resume, Orbital ATK has contracted with rocket maker United Launch Alliance (ULA) to launch a Cygnus cargo freighter atop an Atlas V rocket for the first time, in early December – as I reported here. The Antares rocket is being upgraded with the new RD-181 main engines powering the modified first stage core structure that replace the troublesome AJ26 engines whose failure caused the Antares Orb-3 launch explosion on Oct. 28, 2014. “We are making excellent progress in resuming our cargo delivery service to the International Space Station for NASA under the Commercial Resupply Services (CRS) contract,” said company officials. After engineers finished acceptance testing and certification of the RD-181, the first dual engine set was shipped to Orbital’s Wallops Island integration facility. They arrived in mid-July. A second set is due to arrive in the fall. “The RD-181 engine provides extra thrust and higher specific impulse, significantly increasing the payload capacity of the Antares rocket. This state-of-the-art propulsion system is a direct adaptation of the RD-191 engine, which completed an extensive qualification and certification program in 2013, accumulating more than 37,000 seconds of total run time,” said Scott Lehr, President of Orbital ATK’s Flight Systems Group, in a statement. Then they will add new propellant feed lines and first stage avionics systems. 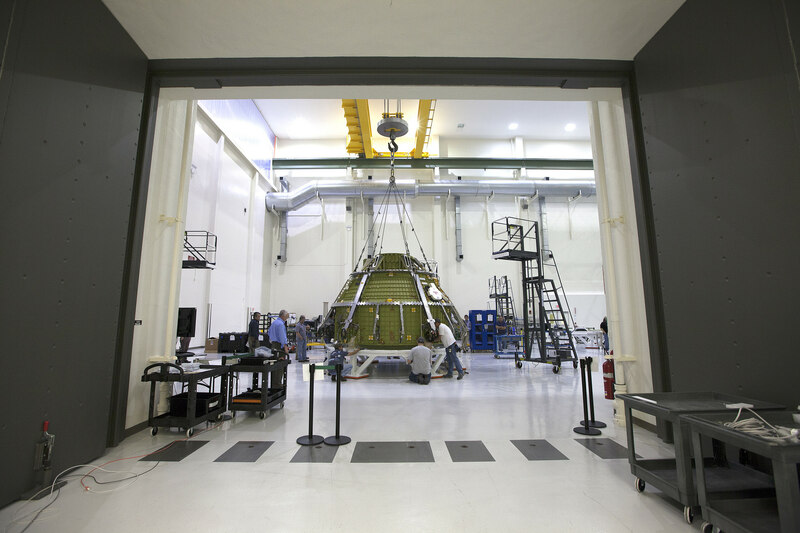 “Significant progress has been made in the manufacture and test of the modified hardware components, avionics and software needed to support the new engines,” said Mike Pinkston, Vice President and General Manager of Orbital ATK’s Antares Program. Simultaneously, teams have been working hard to repair the Wallops launch pad which was damaged when the doomed Antares plummeted back to Earth and exploded in a hellish inferno witnessed by thousands of spectators and media including myself. Repairs are expected to be completed by early 2016 to support a launch tentatively planned for as soon as March 2016. SpaceX, NASA’s other commercial cargo company under contract to ship supplies to the ISS also suffered a launch failure of with their Falcon 9/Dragon cargo delivery rocket on June 28, 2015. NASA is working with both forms to restart the critical ISS resupply train as soon as can safely be accomplished.